Roman Republic. Ti. Claudius Ti.f Ap.n Nero. 79 BC. 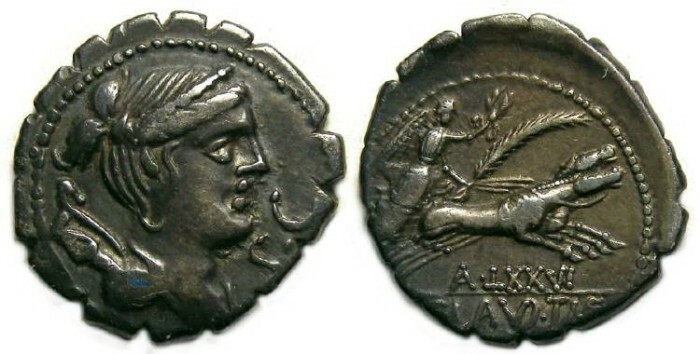 Silver denarius. Denomination : Silver denarius serratus. MINT : Rome. Reference : Sear-310. RSC - Claudia 2. Size : 17.9 x 19.6 mm. Weight : 4.15 grams. Grade : VF with very dark old collection toning. Obverse : Head of Diana right witha bow and quiver over he shoulder, with S C to the right. Reverse : Victory driving a biga right, holding a plam branch, with TI CLAVD TI F AP N in two lines below (the start and end of the inscription are off the flan), with the mint control mark A LXXVI below the horses.